The shutter button can be operated with a smartphone via a Bluetooth connection to the camera. * This function cannot be used on the DC-GH5 (Firmware Version 1.0 - 1.1). Please update to firmware version 2.0 or higher. When Burst mode has been set, pictures can be taken in quick succession by sliding in the LOCK direction. Video recording is started. Tap again to stop recording video. Even when the camera is turned off, it can be woken up and operated remotely. See digital camera operating instructions for details. The camera automatically turns on, allowing it to make a Wi-Fi connection automatically. When the smartphone connects to the set wireless access point, the camera's images are automatically backed up to the preset cloud storage. Please set the wireless access point with the camera in advance. You need to log in with your ID. If you do not have an ID, follow the instructions on the screen. Select and register the cloud storage service you want to use in “Cloud Storage Link Settings” in “Web service link settings”. * See digital camera operating instructions for details. Backup may be interrupted depending on battery remaining. Set wireless access point to be used for backup. Please set the wireless access point with the camera in advance. Set the size of images to be backed up. Follow setting instructions on screen. If you set the [Remote Wakeup] of the camera connected by Bluetooth to [ON], if the smartphone connects to a wireless access point when the camera is turned off, it automatically backs up images on the camera. When [Auto Transfer] is set to [ON], with the camera connected by Bluetooth, images will be automatically transferred to the smartphone, and added to [Camera Roll] (iOS), or [Gallery] (Android) every time you shoot. Every time you take a picture, it will be automatically saved to [Camera Roll] (iOS), or [Gallery] (Android). When [ ] appears translucent on the camera recording screen, images cannot be transferred automatically. Please check the connection status of the Wi-Fi with the camera. When [Auto Transfer] in the [Bluetooth] is set to [ON], [Wi-Fi Function] is disabled. * This function is not available on smartphones not equipped with GPS (location information acquiring function). Location information will be written to the recorded pictures. When taking still pictures in certain locations such as indoors, accurate GPS location information may not be available, and location information may not be saved. When [Auto Clock Set] is set to [ON] with the camera connected by Bluetooth, you can synchronize the camera's time and time zone with the smartphone if you connect to your camera. Save the camera settings onto smartphone and use the same settings on multiple cameras by loading it onto the camera. [Save setting] Save setting information of the connected camera onto smartphone. 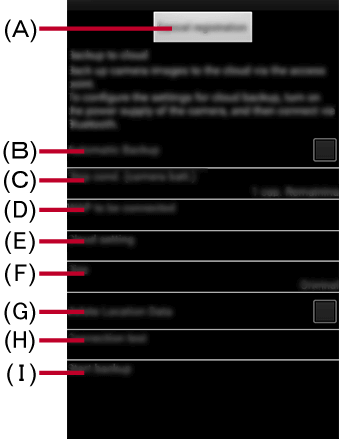 [Saved camera settings] Setting information corresponding to the connected camera will be displayed. The following menu will be displayed when you tap on setting information. Setting information will be loaded onto the camera. You can change the name of the setting information. The name of the setting information saved by default is shown below. Camera setting information will be saved on the smartphone. Up to 10 items can be saved. Tap on the settings you want to load from [Saved camera settings], and select [Send to Camera].